Despair, and Other Stories of Ottawa is a 1994 collection of short fiction by Andre Alexis. It was heralded as “the fiction debut of the year” (Toronto Sun), and was a finalist for the Commonwealth Prize. Toronto-based theatre director Ross Manson and Fredericton-based classical composer Andrew R. Miller adapted several of the stories to the stage for Volcano that same year and this adaptation went on to play the duMaurier World Stage festival in 1998. This 2006 revival brings Canadian theatre superstar Yanna McIntosh to the project. In Despair, two slyly arch narrators, accompanied by solo double bass, uncover a fantastical underbelly to the nation’s capital. In this Ottawa, quiet inhabitants lead outwardly banal lives that conceal sinister realities: worms infest innocents; plants are manufactured to feed the poor, only to doom them to fatal paroxysms of pain; a polite stranger feeds on the bodies of dead priests. Things end badly. This is a look at Ottawa like no other, a surreal underworld of displacement, imbued with a cursed magic realism: ghost stories for the 21st century. — Paula Citron, The Globe and Mail. 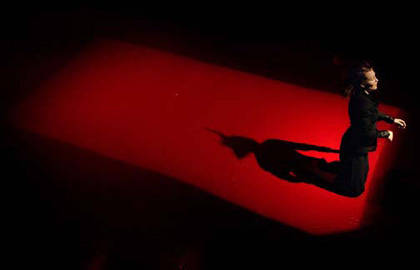 May 4 – 7, 2006: Produced by Kate Alton and Crooked Figure Dances, in association with Volcano. Performed at the Theatre Centre, Toronto.